Specialty medications now account for one-third of all spending on drugs in the U.S., up from 19% percent in 2004, and heading toward 50% in the next 10 years*. The trend has led to the boom in the specialty pharmacy business, which by one estimate grew to $78 billion in sales last year from $20 billion in 2005. Specialty pharmacies are proliferating in response to the exploding number of medicines that cost tens or hundreds of thousands of dollars a year and are used to treat complex or rare diseases like cancer, rheumatoid arthritis, HIV, and hemophilia. But because of stringent rules from medical plans and specialty pharmacies, some patients face potentially life-threatening consequences as they anxiously await news of whether a new shipment will arrive before an old one runs out. Click here to see a new New York Times article on one family’s plight, along with questions that are emerging about the role and business practices of specialty pharmacies. With the work of The Action Group’s Specialty Pharmacy Care Delivery Learning Network gaining national attention, Carolyn Pare, president and CEO, was invited to discuss the high cost of specialty medications on HealthCare Consumerism Radio. Currently, employers who buy health care coverage for their employees are on the hook for those costs. But with astronomical price tags, the breaking point may be near. There’s a real likelihood that specialty drug pricing could financially overwhelm employers. In this interview, Carolyn discusses the issue, why it matters, and what employers can and should do to stem the tide. 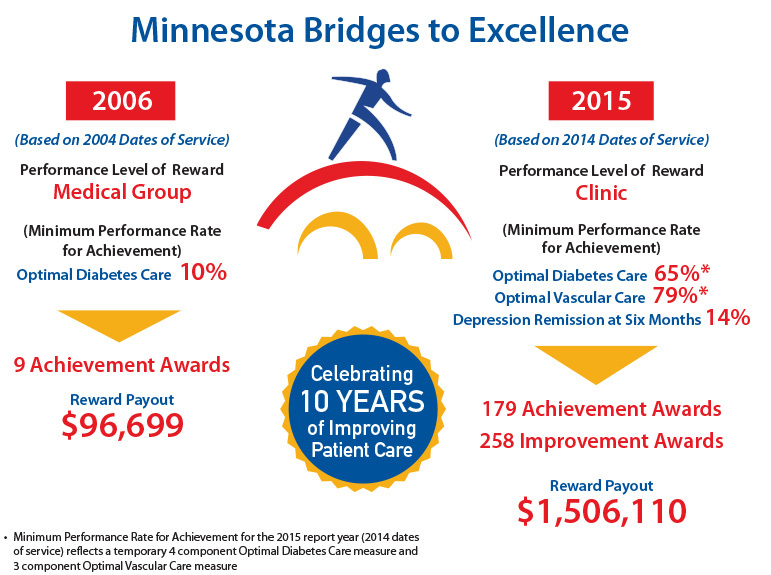 MNBTE advances care delivery and outcomes by rewarding clinics for meeting or exceeding a strict set of care standards for patients with diabetes, depression, and vascular disease, which are primary health care cost drivers. “While The Action Group seeks to improve health, reduce health care costs, and ensure the economic vitality of all Minnesota communities, reducing the impact of depression on the individual, their families and employers is equally important,” said guest speaker, Sue Abderholden, executive director of the National Alliance on Mental Illness (NAMI) Minnesota. She went on to thank the many clinicians and employers in attendance for their work in helping people recover from depression. “Providing hope for recovery is the best reward of all,” she says. Click here to see Sue’s blog about the event. To learn more about MNBTE, click here. Click here to see photos from the recognition event. “Help and Healing: Depression Resources for Care and Recovery,” can be found here. The toolkit includes things like patient/ provider talking points, treatment guides, and self- management techniques, promoting family involvement, and providing information about suicide. The focus is on traditional and holistic care involving nutrition, exercise, meditation, mindfulness and more. One in five Americans lives with a diagnosable mental illness, with about $150 billion being spent annually on hospitalization, drugs and therapy. Workers with mental illness can expect to earn less than others – about $16,000 less each, or about $193 billion annually in unrealized earnings, according to a 2008 study published in the American Journal of Psychiatry. The cost to the economy of major depressive disorders alone rose to $210 billion in 2010, up from $173 billion in 2005, according to a study published in 2015 in that journal. “There is a lot of stigma around mental illness,” says Peter Cappelli, Wharton management professor and director of the school’s Center for Human Resources. “There are still a lot of people who believe it is character rather than something physiological. They believe if you really wanted to fix this you could do it. I don’t think mental illness is very well understood.” Read more here. The Action Group is a go-to resource for all purchasers of health care, whether you are a large or small employer; self-insured; private or public; for-profit or not-for-profit. Because we are focused on health care, and only health care, we create an environment for working together toward a common purpose to address common needs. The collective strength of our members allows us to do together what no organization, company or person could do alone. Learn more about the benefits of membership – and how to join – here.